This world map tapestry "Antique Map" shows a most beautiful ancient world map. From a design from the 17th century, this world map shows the world map surrounded by art work, which was typical of the style of cartography from the era. The cartographers of the time relied on data from explorers on their sea voyages and translating this information to a flat world map for both an art and science perspective. Here we see King Neptune, the Roman god of water and the sea, which is the counterpart for the Greek god Poseidon. He is seen here riding on his vessel, as well as the icons of the sea, the dolphin, sailing ships, the compass and whales decorating the surrounding artwork. The color palette is beautiful in this work and makes use of blue greens as well as earthy browns to balance the theme of earth and water. 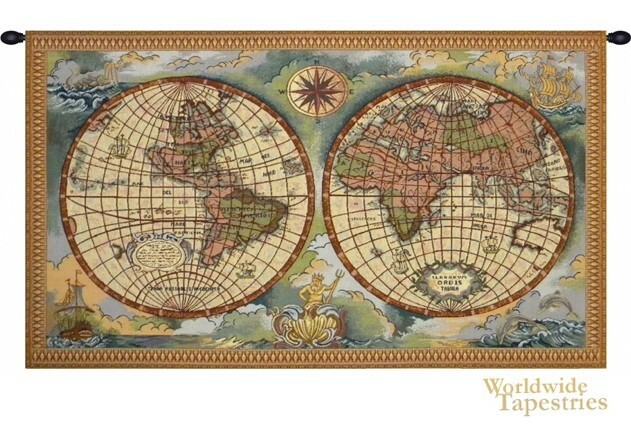 This world map tapestry "Antique Map" is backed with a lining and has a tunnel for easy hanging. Note: tapestry rod and tassels, where pictured, are purchased separately.